Across the board, in all my conversations, it is becoming increasingly apparent that 5G is the perfect storm of once-in-a-decade infrastructure modernization that will bring together the key trends we, as an industry, have been speaking about for several years. Bear with me as I name-drop some of these key trends – Software-Defined Everything, Cloud Native, DevOps, Artificial Intelligence / Machine & Deep Learning, APIs, Automation, Orchestration etc…. More importantly, though, I think there are four higher-layer transformations occurring, and these technologies are just an ephemeral set of technologies and architectures which form the initial foundation of those transformation. 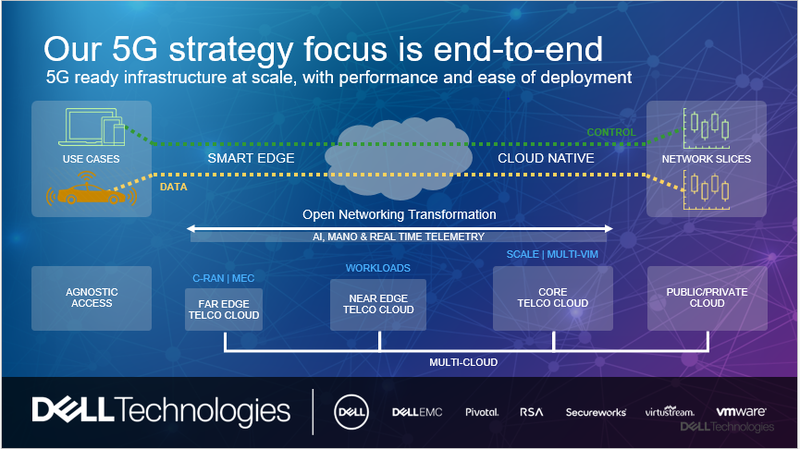 Dell Technologies has not been shy about its viewpoint on the importance of technology to help drive organizational innovation and success. I believe, in some ways, the term “5G” has become the aggregate of the four approaches to technology transformation – Digital Transformation, IT Transformation, Workforce Transformation and Security Transformation – applied to the mobile network. Digital Transformation – monetization of data analytics and artificial intelligence. Whether we talk about autonomous vehicles, Augmented Reality, or IoT – at the core of just about every 5G network transformation business case is the need to transport, aggregate, process, and react to massive amounts of data collected from “things.” For the first time in any of the “G” evolutions, services are top-of-mind for service providers, and we are witnessing a use-case driven network upgrade focused on Digital Services forming the foundation of future revenues. IT Transformation – modernizing infrastructure to support automated processes. New use-cases are great, but they cannot be realized by doing what has always been done – building proprietary, vertically-integrated networks that are opaque to services and infrastructure operations. Virtualization (both hypervisors and containers) and open networking, and storage, provide the foundation for a 5G multi-cloud future. This future is where Cloud Radio Access Networks (C-RAN), Edge Clouds, Telco Clouds, and Public Clouds are fully integrated, and real-time telemetry and automation provide the tools to more efficiently build and manage services. Workforce Transformation – providing the tools and skills for operations to take advantage of the new infrastructure capabilities. IT Transformation is only as successful as the workforce capable of taking advantage of it. Such a workforce is skilled in more than just mobile networking and organized to take advantage of integrated development and operations (“DevOps”). Cloud native, horizontal 5G networks won’t be operated in the same way that proprietary, vertically-integrated 4G networks were. Mobility and Networking experience are no longer sufficient – operational “excellence” will integrate this domain knowledge data science and computer science skill sets (data modeling, API scripting/programming, application development). Security Transformation – integrating natively into all services and processes, rather than as an overlay. These foundational shifts to the services, infrastructure, and workforce cannot be done in isolation of a security transformation. Networking and security are evolving in tandem, and 5G is a beneficiary of that evolution. I see security as both an opportunity to monetize the 5G network with unique Security-as-a-Service offerings but also as a foundational overlay to all services, infrastructure, and processes. Point products, such as firewalls and intrusion detection systems (IDS) will give way to data-driven, automated security frameworks that leverage the underlying programmable infrastructure for both visibility and enforcement. Needless to say, each of these transformations and how they relate to 5G is complex. That is why Dell EMC is not sitting still in 5G. We continue to work closely with industry leaders to define how infrastructure, operations, and services are realized through 5G network transformation, and how we define and realize 5G ready infrastructure at-scale, with the performance and ease-of-deployment needed to capture new Digital Service opportunities profitably.